I've actually done this before. I had a shop light on either side though and they were HOT! shnelson, that's an outstanding idea there. It looks a lot more durable than the cardboard version too. May I ask: I noticed you are using CFLs for lighting. Have you (or anyone?) tried the new LEDs for lighting? I am curious as to heat issues for extended using times. Again, helluva job with this! Though instead of using staples, I used some binder clips so I can fold it back up and store it flat just about anywhere when I am not using it. Haven't had a ton of time to play around with it, but the early results look strong. I like the size of that and the ability to fold it flat for storage but I'm just thinking of how to be lazier at making that. The idea of being able to fold it and hide it in the closet when not in use (which I would assume would be a lot of the time) really appeals to me. I will test it out tonight, as I left the netting on one side, which currently is the top. I will make it the "side" tonight and see how it looks. It will probably be about 5-6 hours from this post though, as I have a lot going on tonight. Doodle, sorry for the later than planned response. I got called out to shoot some photos last night and got home around 12:30 and still had to make up for the time I missed. It was probably a good idea though, as I only have one flash and used the sun as the other "light" just a few minutes ago for this comparison. In the left image, there is blue mesh on the two sides, with the plastic table cloth on the outside (getting it on the inside was a big hassle since I wasn't stapling it and was using clips). The image on the right is with the two sides removed and just the plastic table cloth on it. I expected to be able to see the mesh, but even at 100% I couldn't. If you want to see each image at 100%, let me know and I will attach them later. 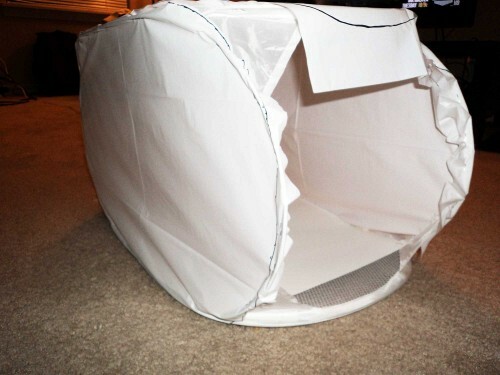 One thing I will say though, is I think you could easily leave the mesh on it and just drape the plastic table cover over the thing, just making sure its close to the hamper itself. At that point, you can just fold up the table cloth and put it in the basket then collapse it and store it. Oh wow, those are distinctive between the two, aren't they? Thanks for posting those Doug. That's all I think I need since there is white cardboard here at the house already. Good to go! Thanks again for posting those and the idea of draping the cloth (as compared to the full renovation). I appreciate it! As I said, I only have one flash and was using the sun on the right side of this, so maybe while I was changing the set up the sun came out a little more or went behind a cloud somewhat. That really could have altered the shot. I was hoping for a white one, but they didn't have any and I am impatient when I want to do something. I would suggest just trying to drape the plastic table cloth over it first and doing some test shots and seeing how everything turns out before going another route. This is genius! I will indeed be making one of these this week. I really Likes it, It will be my next semi portable one! of course we still have my Ghetto Light Box.. :oeven cheaper and is made on the fly!! !